Beautifully scented 8 ounce soy candle includes premium gift box. Natural color, no dye added. Vegan soy wax and fragrance ingredients. Thick Glass Candle Cup weighs 10 ounces & contains 8 ounces of wax. Total weight of glass cup with wax inside is 1 pound & 1 ounce (18 ounce total weight). Handmade by Artist Shoushan. Beautifully scented 8 ounce soy candle includes premium gift box. Thick Glass Candle Cup weighs 10 ounces & contains 8 ounces of wax. Total weight of glass cup with wax inside is 1 pound & 1 ounce (18 ounce total weight). 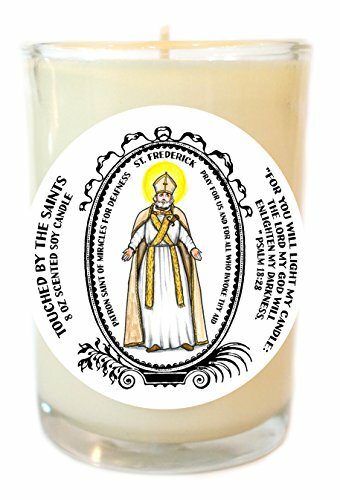 If you have any questions about this product by Touched By The Saints, contact us by completing and submitting the form below. If you are looking for a specif part number, please include it with your message.